We begin with the third 26C appearance by probably the number one most prolific d’n’b producers out there today, the guys that always get top reviews for their untouchable sound, their reliably dope releases, and their always packed performances as seen at every LA show they’ve ever played, here come the one and only TOTAL SCIENCE (CIA, Advanced, Metalheadz / UK / 2:30-4:00). Next up, a new star whose explosive rise is approaching light speed, a man in the midst of releasing a string of fresh tracks, a target of endless buzz among all the djs who have already discovered his sound as well as those who hear him for the first time, flying in from the UK in support of his new release on Total Science’s CIA label, get ready for the first ever west coast appearance of what will surely be many more to come by BARON (CIA, L Plates, Phuturo / UK / 1:00-2:30). Of stateside origins, we’re proud to present one of our favorite American producer/DJs, a recent arrival to LA having come cross country from New York after many years of rocking the kids at home back east, widely respected as the first d’n’b producer to come out of Long Island, an internationally known producer having released on several of America’s most prominent underground labels as well as UK labels, currently on tour in support of his “Firing Pin” CD which showcases all original productions, the man with some of the quickest hands ever to be seen on the decks, step up to the front of the crowd and watch his mind at work, it’s the JO-S (Rawkuts / NY-LA / 12:00-1:00). Up next, one of LA’s long time favorites, co-conspirator from the Cerebral Integration camp, co-creator of LA’s recent Sunday night d’n’b weekly “Progress”, co-ming with the sounds LA knows and loves, it’s ORIGIN (CI, Sunset Pressings / LA / 11:00-12:00). Found first by 26C more than 18 months ago, now playing out constantly, now releasing his first single “Say it Loud” on his Encrypted Recordings label, representing the county of Orange, MADHATTER (26C, Encrypted Recordings, Protokulture / OC / 9:30-11:00). Continuing a string of well received 26C appearances, check these two young talents as they bust a little team action on the decks, it’s LEFTY tag-team RECKTIFY with their MC (PVM Collective, Globe / IE / 4:00-5:00). And rounding out the lineup playing for us for the first time, PERCISE (Lajunglist.com, Beyond Fame / OC / 5:00-6:00). Jungle Bells will be going off with a full production at a new LA location (15 minutes from Hollywood), directions to which will be released on the night of the event. The venue has a main room where the music will be, a side lounge area, and a big outdoor smoking area. We'll have really loud and really clean sound by PAS. We'll have live video mixing and projections with intelligent lighting to support it. Plus a huge inflatable big glove boxing ring! This event, like past 26C holiday events, will benefit the underprivileged children of LA’s inner city. Our last holiday event successfully collected a huge stockpile of toys that we donated to LA’s Hollygrove orphanage. Bring a toy to donate and help us put together an even bigger load of toys this year. Toys should be new, unwrapped, and in the original packaging please. 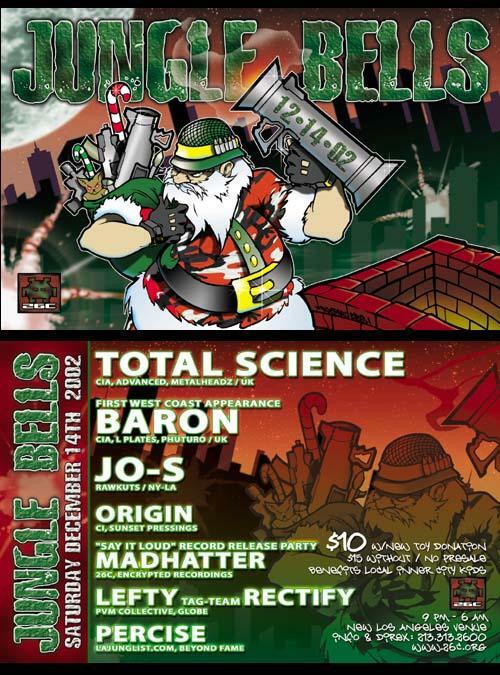 Admission to Jungle Bells will be $10 all night with a toy donation, $15 without. No presale. For updates and directions call 213.313.2600.